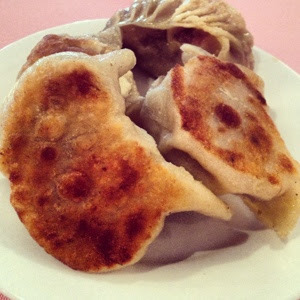 Every Sunday morning, I wake up craving Dim sum. Sometimes I get my wish and sometimes I have to settle for a regular brunch or boring breakfast. Last Sunday I woke up a little late and decided to give my Mother a call too see if she would sneak away with me for some yummy Dim Sum. As soon as the words left my mouth, she was on her way out the door to meet me. Last second, we decided to ask my Father to join as well, he would have been jealous and it's the only nice thing to do - especially since he was with my Mom when I asked her to join me. We arrived at Tong Por at around 1 pm to a full restaurant and parking lot. We told the hostess that we needed a table for three and she asked us to grab a seat and wait a while. After about fifteen minutes, we were asked if we would share a large table with another couple so that we wouldn't have to wait. We said we would and we were quickly seated at a large ten person table with another quiet couple - I know a little weird but actually turned out to not be so bad. The karts of food started to stroll by leaving behind delicious smells of yummy dumplings, shrimps and other Asian goodies. We started ordering dish after dish and I noticed that the French couple at our table couldn't figure out what to order - you come for Dim Sum and not know what to eat? Really? I laughed it off and dug right into our steaming hot dishes. We started off with one of my favourites, fried crab balls. I do not order them often, but when I do, I eat as many as I possibly can. This time I only managed two. The crab balls were flavourful and delicious, a bit greasy though. This first dish set forth the pace for the rest of our meal. 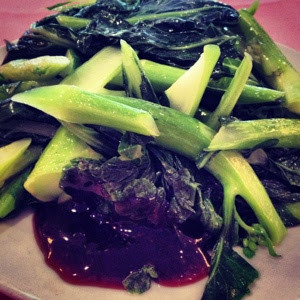 We then had Asian greens. Tender yet still crisp and very flavourful, these greens are delicious and yes they were also greasy. Slowly, more karts started to pass by and we filled our table with fried squid, pan fried pork and shrimp dumplings, fried noodle cakes of pork and greens, har cheong fun (shrimps wrapped in rice noodles), Asian eggplant stufed with shrimp and last but definitely not lease sesame balls filled with a sweet bean paste. Everything was delicious, well balanced and flavoured just right. 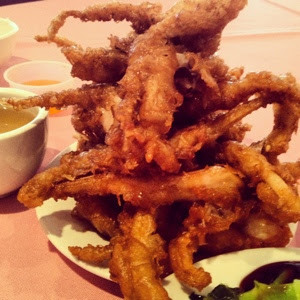 The squid was crispy, tender and sweet, but very greasy compared to other Dim Sum places. We really enjoyed eating it, but my stomach wasn't too happy later. The pan fried pork and shrimp dumplings were delicious. The pork was flavoured perfectly but still very greasy and heavy on the stomach. The noodle pan fried pancakes as i call them were the least greasy dish on the table. Tender, crispy and just plain old delicious, these treats are not to be missed. 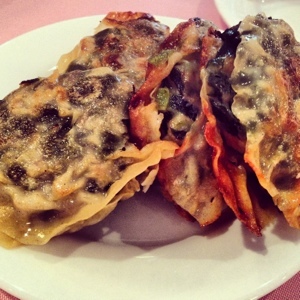 Even for the inexperienced Dim Sum eater, these bad boys are always a must. 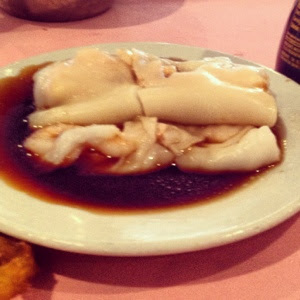 Har cheong fung, or shrimps wrapped in a rice noodle, are very simple, lightly flavoured but till a necessity at every Dim Sum table. 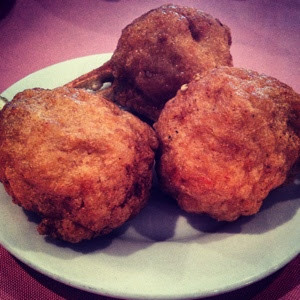 I love the pork version too, but there is something I truly love about the shrimp filled ones. They are lightly flavoured and drenched in a soy sauce, I love simple food and this fits right in to that category. I love Chinese eggplant. Whether it is sautéed in a delicious sauce, grilled on the BBQ or steamed with other veggies, there is something about the vegetable that I truly enjoy. 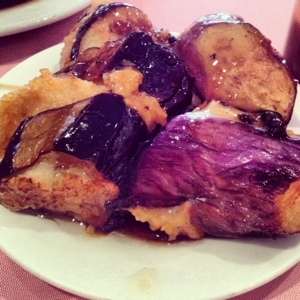 One my favourite ways to eat Chinese eggplant is at Dim Sum when it is stuffed with shrimp or crab and sautéed into a delicious hoisin based sauce. At Tong Por they really know how to make this dish - I think it is the best Ihave ever had! The tender and well flavoured eggplant is sliced on a bias and stuffed with delicious shrimp paste - so good I wish I had some right about now. We all agreed that this dish was the only dish that was not overloaded with oil - just plain old delicious. 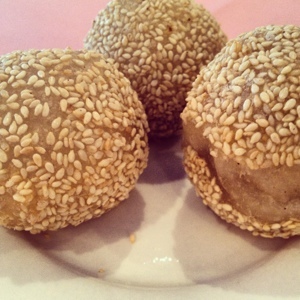 Sesame balls filled with a sweet bean paste is my Mother's favourite part of Dim Sum, and who could blame her. These balls of rice dough fried and rolled in sesame seeds and stuffed with a sweet delicious been paste and not to be missed. After finishing our desserts, we rolled our way out the door of the restaurant and into our cars. Even as full as I was, I was dreaming of my next dim sum meal - I may need to go into dim sum rehab! Since travelling to Italy, I have become such a snob when it comes to eating Italian food. I don't enjoy pizza as much, except for a couple of places, pasta dishes seem bland and tasteless, and don't get me started on the meats. I just don't get it. Italian food used to be my favourite, but now, I just keep dreaming of the day I can go back and eat till explode, literally! I am saved sometimes as my co-worker is a from Italy and happens to be a killer cook. She satisfies my gnocchi craving when I need it the most. So when I came across Spiga on my restaurant quest of St. Martin, I was cautious, but hopeful. My sister works at Victoria Park along with my best friend, so on a random Wednesday, I headed to Westmount to meet them for lunch. The casual warm setting of Lavanderia was very relaxing. I loved the calming colours and homey feel to the place as it does pay tribute to Chef Antonio Park's childhood home above his parent's Lavanderia or laundromat - Hence the name! We started our lunch with a coconut fish broth soup served in these adorable little cast iron bowls. The broth was full of flavour, creamy and smooth. The chunks of potatoes were tender and soaked up the flavour of the broth perfectly. I can see why my friend claims this is her favourite soup! Vacation time is always the best time. Planning every part of your trip and then finally getting to experience everything you hoped for. This year, my girlfriends and I planned a last minute spontaneous trip to St. Martin with a stop in Anguilla. I of course was excited for all the food. The research started once my flight was booked, and did not stop until I felt we had more than enough options. I can get obsessive, so I had to really narrow down my list. At the top of my list were a few, but one kept reappearing, Le Santal. Sitting on the beautiful beach of Sandy Ground St. Martin, Le Santal blew my expectations like no other restaurant has ever done before. We pulled up to the restaurant where the valet and hostess were waiting for us. Our car was taken to the parking lot and we were escorted to our table. Our table was overlooking the water, so beautiful so calming, we really enjoyed the view. Think of us for your next catering needs! A Famished Foodie™ I'm a former industry employee/slave and an all around food addict who loves nothing more than, well, eating. Follow me on my eating frenzy; the good and the bad.